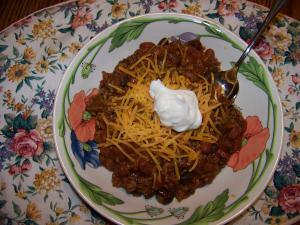 A good hearty winter meal; one of our favorites! Cook meat in a large saucepan over medium-high heat until meat is browned, stirring until it crumbles. Drain, if necessary. While meat cooks, drain and mash 1 can of beans. Add mashed beans, undrained beans, salsa, tomato sauce and seasoning mix to saucepan. Stir well. Cook over medium heat 10 minutes or until thorougly heated. Spoon into serving bowls. Top with additional toppings, if desired. NOTE: Poster notes that the recipe says it makes 7 - 1 cup servings, but who eats 1 cup of chili for a main dish?! She noted that this was about 4 good servings. She used one can of black beans and one can of seasoned pinto beans with liquid, Newman's salsa and Penzey's chile powder, and also added some Penzey's chipotle powder. Stacy's Notes - Made October 2003. This was quick, and really good! Used 1 pound ground chuck and 2 cans black beans as directed. I used 1 cup of On the Border brand salsa, about 1 1/2 tablespoons of chili seasoning from a packet, and a pinch or two of chipotle powder. Served with tortilla chips, sour cream and shredded cheddar. Also, I used 1 can plain tomato sauce and one can of roasted garlic flavored sauce. Tim ate two huge bowls. A definite keeper!